This morning it was breakfast with a Scotsman and his friend from Texas, who were doing an antique ‘Indian’ Motorcycle rally through the Highlands – hundreds of bikers had shipped their classic motorbikes from Europe and America to tour Scotland. We hit the road again, and within an hour we were at the Glencoe visitor center, where a really helpful ranger gave us hiking information - he told us which trails were crowded and which were remote, and which had waist deep stream crossings! 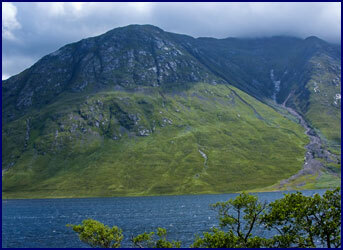 I cannot adequately describe the grandeur of Glen Coe. As we drove through the long valley, we were in awe of its beauty. 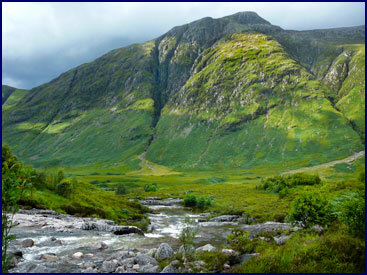 Rugged mountains, their peaks obscured with mist, tower above the River Coe as it rushes down the narrow glen. For me, the place has a mystical quality, a special kind of magic that goes beyond the spectacular scenery, inspiring the imagination. I had been reading about the glen’s often violent history, and I felt like I could still sense the ghosts of the MacDonalds and Campbells, whose clans had feuded here over three centuries ago. Driving through the glen, we came upon a group of people gathered at a scenic viewpoint. 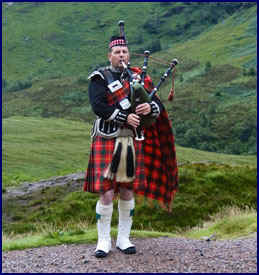 There stood a bagpipe player, framed against a magnificent backdrop of steep-sided mountains, wearing full traditional Highland attire right down to the kilt and sporran. We stayed for a while and listened to the piper play, the music perfectly capturing the mood of the glen, the poignant notes drifting over the hills enchantingly, evoking images of times of yore. 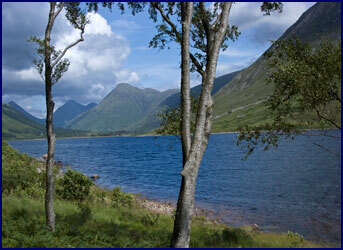 We took the small side road that we had passed by at the beginning of the trip, and drove down Glen Etive. 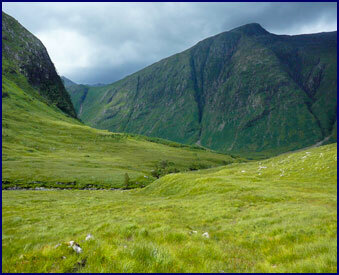 The mountains rose high on either side, a distinctive saddle ridge between two peaks marking the entrance to the glen. 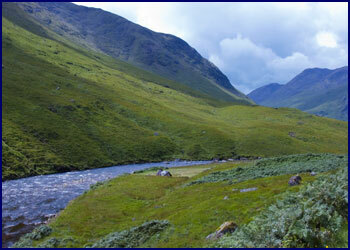 The road followed the River Etive as it descended into a lush green valley. 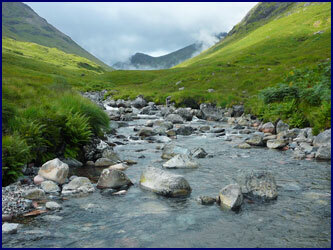 It was an incredibly beautiful and peaceful glen, with a very different mood from Glen Coe. We passed several tents along the small river, where people camped to fish. 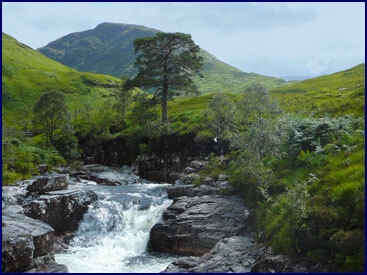 The stream looked like a great place for otters; we knew they lived in the highlands, but they had proved elusive. 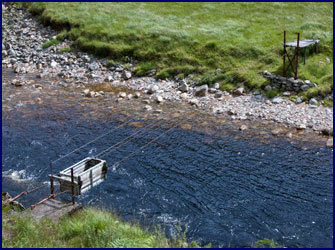 We came to a ‘bucket bridge’ over the River Etive, an ancient wooden box on a cable in which you could stand and pull yourself across; it was very rickety, and you’d have to want to cross very badly to try it. 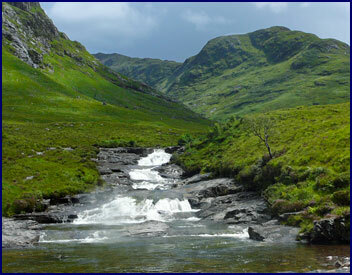 After about ten miles, we came to a wee farm, the first we had seen in this glen – which our atlas showed as Alltchaorunn. There are two small houses nestled in the trees, accessed by a bridge over the rushing stream. 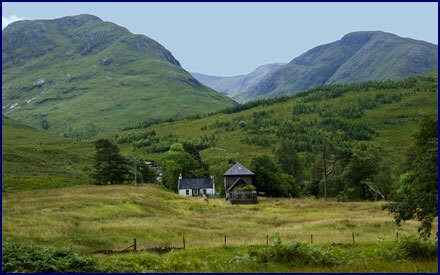 The farm is surrounded by majestic mountains, and a burn cascades down the hillside behind in a series of waterfalls. I immediately fell in love with this place, and decided it would be my new home. It has a small stableyard, surrounded by a stone wall, and a grassy paddock in front that would be perfect for my horse Drifter. I fantasized . . . I would run away from home and live there like a hermit . . . Drifter and I would ride through the glen each day . . .
We only passed two other houses the whole way down the road, one of them being a huge mansion called the Dalness House, with stags and horses grazing in a lush pasture out front. We finally saw an otter, but sadly it was dead in the road; we were incensed – how could anyone drive carelessly enough on this tiny winding road to hit an otter? We passed a number of hiking trails, and oddly enough in this near wilderness setting, another of those old fashioned red phone booths. 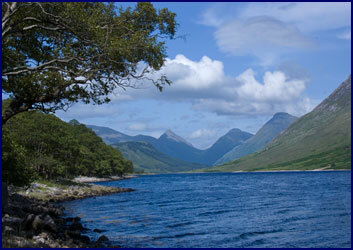 We hiked along the shore of Loch Etive. The path was boggy at first, but soon it climbed to higher ground through the woods above the loch. It was peaceful and secluded – there was no one else on the trail. One of the reasons we had not spent more time in the Glen Coe area earlier in the trip was the expectation that such a popular tourist destination would be crowded, but we realized now that there were plenty of out-of-the-way places to explore. As we followed the trail through the forest, we crossed several lightweight wire fences, over twelve feet high. 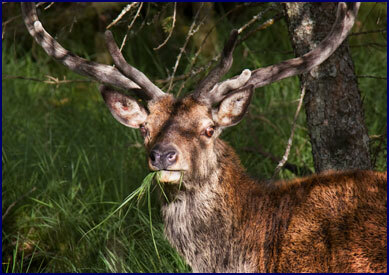 We had seen these frequently all over the Highlands; they are used to keep the deer out of the forests, preventing them from decimating the young trees in the winter when food is scarce. We walked for miles, leaving civilization far behind. The path meandered through the woods, sometimes crossing open meadows and then returning to the forest. Shafts of fitful sunlight broke through the trees, illuminating the moss-covered forest floor. It looked like a good place for Faeries to dwell, and we kept a sharp eye out for Wee Folk. Deep in the woods above the loch we came upon a faery ring, or perhaps it was an ancient Druid meeting place. 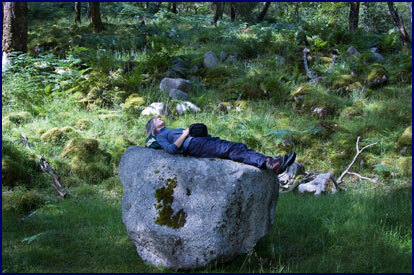 There was a flat circular area with no trees, about 50 feet across, surrounded by mossy boulders. In the center was a large flat-topped rock like a table - surely a sacrificial stone. It reminded me of the ‘Outlander’ books by Diane Gabaldon, where a woman goes through a stone circle in the Scottish Highlands and is somehow transported back in time 200 years, where she meets a handsome Scotsman and has many adventures. We tried using the faery ring as a time portal, but after repeated attempts, we were still in 2009. Jineen on the Sacrificial Stone. We made our way down to the edge of the water, where we sat on a rock and ate lunch. A speed boat went by along the far shore, the only sign of civilization we had seen for hours. It was near sunset by the time we returned to our car. Driving back up the glen, we were lucky enough to see a red deer stag, standing right by the side of the road; we watched him for a while, before driving back to Glen Coe. We walked along the side of Lock Leven in the fading light, looking for otters. It was our last day in Scotland. 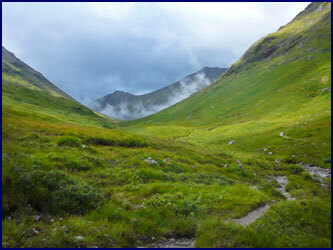 We set out early, hiking up the Laing Eilde Valley from Glen Coe. The path followed a burn, crossing the water several times by way of stepping stones. We climbed steadily across the rocky and somewhat barren mountainside, with spacious views in all directions. The sky was once again sun and shadows, with occasional rain showers slanting down dark against sunlit clouds. 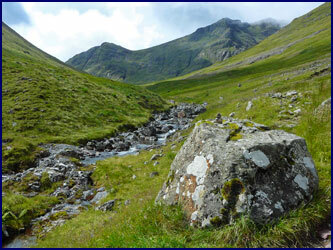 Hiking the Laing Eilde Valley from Glen Coe. We saw a red deer silhouetted against the skyline – then we realized that there were a dozen of them, blending into the mountainside. As we went on we sighted another herd, then another – by the time we reached the top we had counted well over a hundred deer. We could see why the foresters used those fences! Finally we reached the top of the pass and stood on the high saddle between two peaks that we had noticed the day before. The views were spectacular; we were on top of the world. 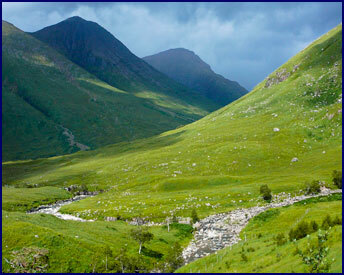 We looked down into Glen Etive before us; we could make out the winding road far below. 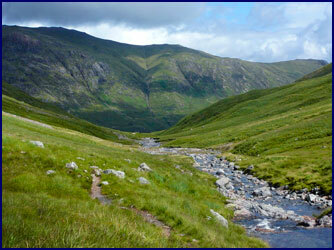 We turned and gazed back on our path up from Glen Coe, amazed at how far we had climbed. A rain shower moved through so we didn’t linger too long at the top, but as we headed back down through the glen the sun came out again, illuminating the rain-washed landscape with glowing light. It was early afternoon when we returned to our car, and with an early morning flight the next day, we had to make the three hour drive to Edinburgh that night. But we were reluctant to leave just yet - we decided we had time for one more hike. 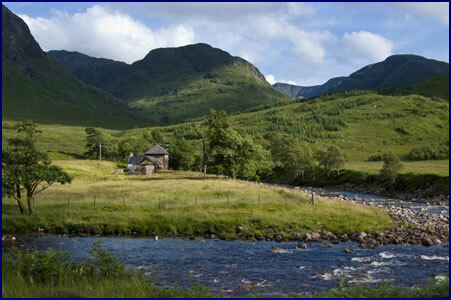 We drove back down Glen Etive to Alltchaorunn, the wee farm by the stream, my new home. We parked by the road and crossed the bridge, then took a small trail that led behind the farm. 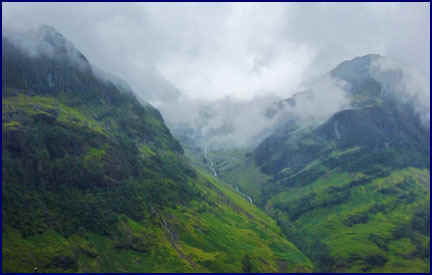 Tall mountains stood majestic, surrounding the rolling green valley. We followed the winding path alongside the stream, passing waterfall after waterfall, the sound of the rushing water filling our ears. We climbed a high stile over a deer fence and continued up the valley. The path led to a deep ravine; we climbed down the steep rock face and crossed over a swift stream on a narrow cable suspension bridge. Soon we were in countryside that seemed virtually untouched, and each time we rounded a hill there were new stunning vistas. It was one of the most beautiful hikes we have ever been on, and we wanted to just keep going, exploring as the paths led us up one valley after another. But sadly, the afternoon was waning, and before long we had no choice but to turn around and head back. 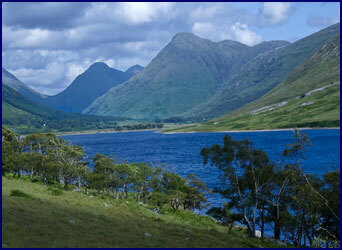 It was with a strong sense of regret that we left Glen Etive. The place seems special - almost like it’s from a different era, where people have lived pretty much the same way since time out of mind - but now it was time to return to the modern world. However, now that we know it's there, we can always go back. It was a sad drive south that evening, leaving the mountains behind. We stopped for dinner at the Golden Lion Pub in Stirling for one last authentic Scottish experience; a dozen kilt-clad pipers marched through the town square playing the bagpipes as Jineen and I sampled ‘haggis with neeps and tatties.’ Haggis is a rather disgusting dish containing a sheep’s internal organs, oatmeal, and suet, boiled in the sheep's stomach, and served with mashed turnips and rutabagas. Jineen liked it, but I found it revolting. After that, it took several laps around town and past the Stirling Castle before we found the motorway again, and then we headed on to Edinburgh. We caught the early flight in the morning, saying goodbye to the Scottish Highlands. But I have no doubt that we will return, and probably soon. 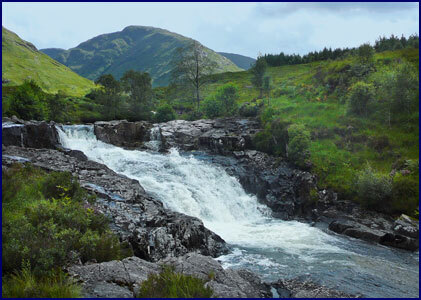 After all, I have to visit my wee farm by the waterfalls again! Of course, the burning question everyone always asks about Scotland is, “What do they wear under those kilts?” Researching this subject is harder than one might think. On the one occasion that we met a kilted Scotsman who was standing still, we briefly considered getting down on the ground to have a look to see what he wore under his kilt, but we were afraid it might spoil the mood . . .
Q. What is under a Scotsman’s kilt? A. The Future of Scotland!